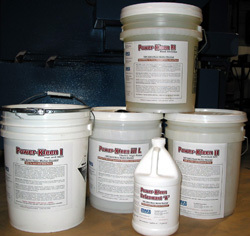 Power-Kleen chemical detergents for aqueous parts cleaning are specially formulated for use in all types of StingRay Industrial Parts Washers to provide highly efficient and very effective industrial part cleaning results. They are specifically blended with defoamers that float on the surface to prevent foaming and are safe for a wide variety of common part materials including both ferrous and non-ferrous metals and plastics. Power-Kleen chemicals are 100% active and highly concentrated. There are no fillers resulting in highly active detergents for extended cleaning before re-charge and clean-out is required. Many detergent suppliers "fill" their aqueous chemicals with non-active low cost ingredients that do nothing except add volume to the chemicals. These fillers end up as sludge in the bottom of your industrial part washer. The result is additional waste to haul off resulting in higher disposal costs. With Power-Kleen, you get 100% active aqueous washing detergent. 100% of the chemical goes to work cleaning your parts yielding lower cleaning costs and lower disposal costs. Power-Kleen detergents have built-in rust inhibitors that protect your parts washer cabinet from harmful corrosion that may be caused with other chemicals and detergents. There is even a Power Kleen rust inhibitor compatible with all Power-Kleen detergents, soaps and chemicals that is designed for short-term rust prevention. The corrosion inhibitor is metered in to your washing machine's rinse water to protect your cleaned parts from flash rust. Our Service Staffs' experience with hundreds of parts cleaning applications similar to yours will guide you in selecting the best Power-Kleen detergent and chemicals for your parts cleaning application. Our trained specialists are experts at providing parts cleaning solutions so you achieve the best possible result with your StingRay Parts Washer. Contact us about your parts cleaning detergent needs or click on the links below for more information.